in Denison, Iowa, is a Spanish Colonial Revival building built in 1940 to go along with a cafe and service station built to assist cross-country travelers. What is the Lincoln Highway? The Lincoln Highway is a 3300-mile long road stretching across the United States from New York City to San Francisco. Its creation was the result of the first successful effort to create an all-weather transcontinental highway specifically for automobiles. Carl Fisher, Prest-O-Lite headlight manufacturer, launched the idea of developing a coast to coast highway in 1913. Fisher was soon joined in the promotion of this road, named the Lincoln Highway, by the cadre of executives from the automobile, tire, and Portland cement industries who used patriotic appeal and mass marketing to mastermind a national "good roads" campaign. and bridge-building techniques. A dynamic, commercial roadside emerged, pioneering the marketing of gas, food, lodging, and other motorist services through innovative architectural form and design. Today, the roads that comprise the Lincoln Highway approximate sections of the present day Federal and State Highway System: US 1, 30, 40, 50, and I-80 traversing New York, New Jersey, Pennsylvania, West Virginia, Ohio, Indiana, Illinois, Iowa, Nebraska, Wyoming, Utah, Nevada, and California. Early in its history, the Lincoln Highway was also routed through the northeastern corner of Colorado. 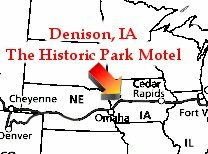 Denison Motel added to National Historic Register DENISON, Iowa - The Park Motel located where highways 30, 59 and 141 meet, has been added to the National Register of Historic Places. The National Register is the federal government's official list of historic properties worthy of preservation. Listing in the National Register provides recognition and assists in preserving America's heritage, according to Dorothy Kutchinski, chairwoman of the Crawford County Historical Society. The Park Motel was recommended for listing on the National Register after Elizabeth Foster, the National Register coordinator for the State Historical Society of Iowa, asked the Crawford County Historical Society to do a complimentary review of the structure, Kutchinski said. Consultant Leah Rogers of Mount Vernon, Iowa, did an historical research report on the structure. Kutchinski met with the Crawford County Board of Supervisors and gave a presentation on the Park Motel. In her recommendation to the board, Kutchinski said, "The property is associated with events that have made a significant contribution to the broad patterns of our history. The current owner, Jason Gesy, is undertaking a major restoration with the intent that it remain as authentic and true to the original design as possible. 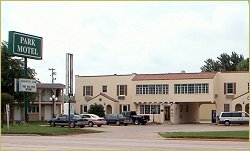 This nomination to the National Register would recognize the significance of this unique, early highway motel to Denison. The Park Motel joins the McHenry House, the Dow House, the Manila Hotel, the Chamberlin House, and six historical bridges in Crawford County that have been listed on the National Register, according to Kutchinski. The Park Motel was built in 1940. Ted Port, the owner, had the motel built with the idea that tourists were beginning to travel by automobile across the country and would need affordable shelter for the night, with food and car care nearby. These would be supplied by the cafe and gas station. across the road, which he had built earlier, when Highway 30 was still a mud road, according to Kutchiriski. The gas station was built in 1926, with the cafe added in 1929, as well as a house for the owner. All these were built in the same style as the later motel. By the time the motel was built, the cafe was owned and operated by L.J. 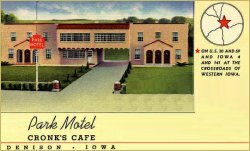 Cronk, and the motel and cafe were, though separately owned, always advertised together. 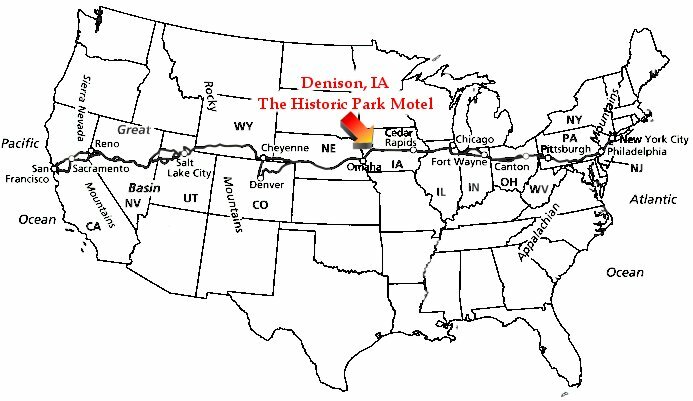 While not built along the original Lincoln Highway, the Park Motel is situated along the right-of-way for the original Lincoln Highway route through Denison. In 1926, when Ted Port had his service station built, Highway 30 had just come into existence. Prior to that, the Lincoln High- way was the main east-west highway route through Denison, having been established in 1913 as the nation's first transcontinental route specifically intended for automobile traffic. Notable exterior features of the Park Motel are the two gable- roofed vestibules, a second-floor bay window, two long rows of casement windows, and a scalloped crenelation-type detail around the base, according to Rogers. Other noteworthy features are the round-arched doorways, the terra cotta tile roofs on the projecting vestibules and porch hoods on both the front and rear of the building. 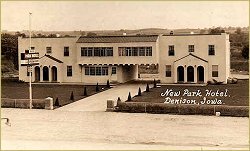 The overall architectural style of the Park Motel is Spanish Colonial Revival, and is a type of architecture that was popular between 1915-1940, according to Rogers. Related to the earlier Mission style of architecture, Spanish Colonial Revival is a simple style distinguished by red tile roofs, stucco walls, heavy wooden doors in round-arch openings, and low horizontal emphasis. The look was intended to re-create the character of a Spanish hacienda. The drive-through of the Park Motel imparts some of the true hacienda effect, leading the visitor through the building and into the rear parking lot of the motel. The Spanish Colonial Revival style was most popular in the Southwest and Florida, Rogers noted. It is not known if Ted Port selected the Park Motel's design from an existing motel along the West Coast, or from some type of standardized set of plans. Since motels were in the early formative stages at the time, it is per- haps more likely that he selected a design from an existing hotel building, Rogers said. Modifications to the Park have been few, which is rather unusual in this type of structure, Rogers said. Therefore, the integrity of the building remains intact. In 1965, two wings were added in a unique way. Instead of attaching the new wings to the older building, the two new wings were added as detached units set at angles to either side of the original building. Thus, motel room space was more than doubled without impacting the original motel building. The Park Motel was also unusual for the time in its design as a two-story structure. Most of the early motels were one-story structures that reflected the evolution from the attached cabins of the tourist camp, or court, pattern to connected rooms of the motel, according to Rogers. The Park has been continuously operated as a motel since it was built in 1940. The list of well-known people who have stayed at the motel over the years includes Denison native Donna Reed, Ethel Kennedy, Elizabeth Dole, and former Iowa Gov. Terry Branstad. "The Park Motel stands as a good representative of a progressive, innovative, transportation-related support service enterprise along Highway 30 in the early, formative days of this important highway route," Rogers said. "It is also a good reflection of the origin of the motel idea, and early motel architecture in the western United States, as it was transplanted by Ted Port to western Iowa."